Does your outdoor space make a good first impression? Your home’s exterior is the first thing that potential buyers will see when they take a tour. Are you making the most of it? 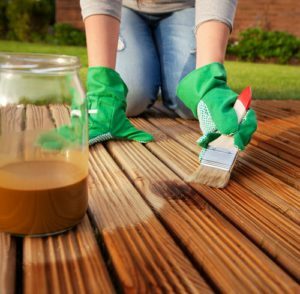 If you think your outdoor spaces could use a little TLC as you get ready to sell, here are some tips to help you stage them like a pro. If you do nothing else, you should at the very least clean up your home’s exterior. This includes trimming trees and bushes, cleaning up dead leaves and debris, and pressure-washing decks, patios and siding. You’d be surprised the difference that a good cleaning can make to the outside. It’s almost like adding a fresh coat of paint. Along with a thorough cleaning, make note of any small issues around the exterior of your home and repair them. We’re talking about cleaning and repairing the gutters, patching the sidewalk and driveway, fixing that faulty step on the front porch and making sure all the exterior lights are functional. Regardless of whether or not your front porch is large enough for people to sit and linger, you should make it as inviting as possible. Repaint your front door to a cheerful and welcoming shade. Add a tasteful and seasonal wreath and buy a new doormat. Add a couple of comfortable chairs if space allows, each with a decorative pillow. Keep it simple, cozy and inviting. If you have a deck, you want to demonstrate to potential buyers how much use they can get out of it. After cleaning, add a new coat of stain or paint to make it fresh. Create distinct spaces with obvious uses. Set up a small dining area, ready for an outdoor meal. Create a conversation nook with chairs or benches arranged around a central focal point such as a fire pit. Even if you think your backyard is not important, you can add appeal by adding a small café table and a couple of chairs to create a space where someone could enjoy their morning coffee. Place a bench near some birdfeeders to draw people out into the yard to see the possibilities. If your outdoor areas feature large expanses of hardscape, soften them with potted plants. Place flowers or topiaries near the front door. Make a corner more inviting with three potted plants of varying heights placed together. Install a wall garden with succulents to define and soften a deck space. Finally, don’t forget all the finishing touches that buyers will notice. Repaint or replace your mailbox. Install new house numbers. Switch out dated hardware like doorknobs and exterior lights. You don’t have to spend a fortune, and it can considerably improve the appearance of your home’s exterior. Ultimately, put yourself in a buyer’s shoes and think about what kind of impression your home’s exterior makes. With a little time and effort, your outdoor spaces can entice buyers to make an offer.